Home » Fall in love with Bordeaux this year! Fall in love with Bordeaux this year! Bordeaux is a fantastic city to visit at any time of year. With amazing architecture, vibrant arts and culture, great shopping and fabulous food – it’s no surprise it was voted ‘Best European Destination 2015’. The centre of Bordeaux was awarded UNESCO World Heritage Site status in 1998 due to the incredible range of historic buildings here. The city is based on the Garonne River and the impressive left bank is lined with half a mile of gorgeous buildings designed and built in the 18th century; the sight was intended to impress visitors arriving in the city and it certainly does the job! The famous Place de la Bourse is the crowning glory with the Palais de la Bourse enclosing the square on three sides facing the river. The Miroir d’Eau is a wonderful addition with the expanse of shallow water reflecting the beautiful palace. Visit in the evening to see the scene dramatically floodlit or join the kids splashing and having fun to cool off on a sunny day. Other must-see architecture includes three UNESCO recognised churches that form part of the Route of St James pilgrimage trail dating back to the 12th century. Get a great view of the city when you climb the 231 steps up the Gothic belfry at Cathédrale St-André and marvel at sculptures that rival the grandeur of Notre-Dame in Paris. Next visit the Romanesque style Basilique Saint-Seurin to see the stunning interior decorated with alabaster reliefs and its fascinating 11th century crypt. Finally, marvel at the flamboyant Gothic style of Basilique Saint-Michel. Dedicated to the Archangel this church has a flamboyant Gothic style and took over 200 years to build. Once you have the main sites covered, the city is your playground! From museums and art galleries to shops that range from high end boutiques to quirky independents and daily markets selling everything from antiques to wonderful local produce you’ll be spoilt for choice! Discover the ruin of the immense Roman amphitheatre Palais Gallien, visit the wine cellars of Millesima where more than £100 million of fine wine is stored and spend Saturday morning at the covered market Marché des Capucins enjoying fresh local oysters and crisp white wine from one of the many seafood stands. Buy the ingredients for a picnic and take some time to wander and explore. Jardin Public covers 25 acres in the heart of the city and includes a carousel and playground, botanical gardens and a museum. Parc Bordelaise is another good choice, this public promenade dates from the 19th century and is lined with over 3,000 trees. If you’d rather be by the river head for Esplanade des Quinconces (thought to be the largest square in Europe) to see the impressive fountain and enjoy waterfront views. In the evening it’s fun to explore the warren of medieval streets in the St Pierre district and visit some of the many bars and restaurants there. Or, for a truly decadent experience, book tickets for the Grand Théatre! The building is a show in itself; Corinthian columns, statues of muses and goddesses and an opulent interior set the perfect scene for an evening of opera or ballet. Bordeaux is a great choice for a short break or stop-over on your journey too or from the South of France. It’s a vibrant city with a great atmosphere and plenty to do for families, couples or friends of any age – you’re sure to fall in love with the place! By boat: Boat trips down the Garonne River are a great way to take in the architecture and atmosphere. 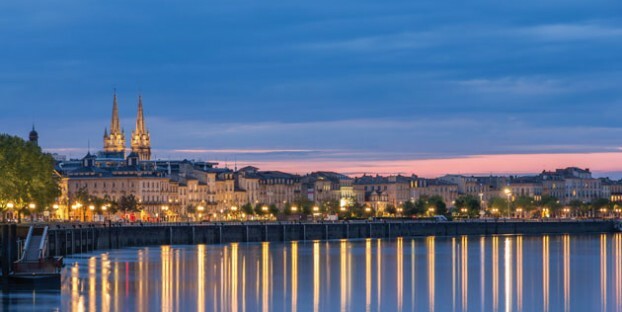 Choose a city cruise or take a longer excursion that will take you out into the famous Bordeaux vineyards and can include wine tasting and a meal on board. By bus: Open top bus tours take in all the main sites and include a commentary in English to tell you more about the fascinating history of the city. By bike: As with most French cities, Bordeaux is very cyclist-friendly with bikes for hire, designated bike lanes and plenty of parks and pedestrianised zones. By tram: The Bordeaux tram network has 90 stops on three different lines criss-crossing the city. Get a day-ticket for unlimited travel and explore! Fishing for a holiday in France this year?